This is a typical problem we encounter on MViews, and the answer is that there are many names Irish hills are known by, often they sound very alike and the spelling varies with opinion of the original recorder as to what they heard. In this case the hill is first recorded in the Lythe map of circa 1568 as Knocke Gree, later after a few variations, in James Williamsons map of county Down of 1810 it is recorded as Knockcree. 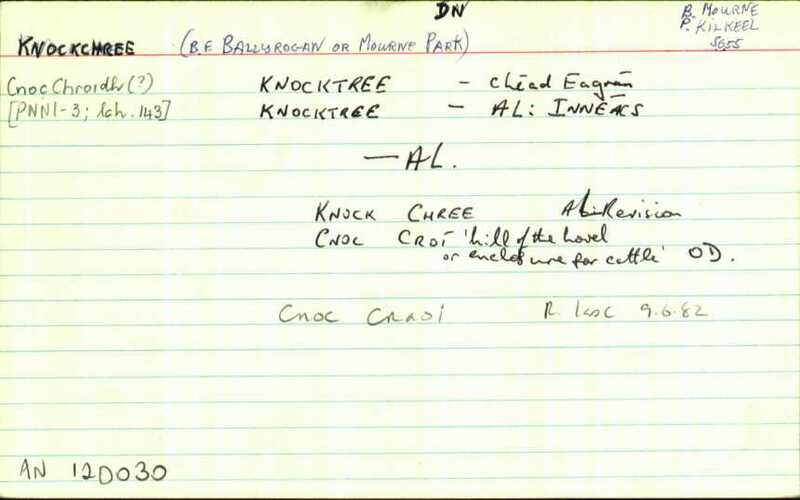 Today it is recorded as Knockchree by Osni, Osi, Loganim.ie and Placenamesni.org. The same is true of the translation, with "hill of the hovel" and "hill of the cattle" being some, but I can't find " hill of the herbs". We will add your comments to the hill information on the website but will have to retain the official placename.